CB&Q Chair Car 4741 "Silver Maple"
L&N Club Car 3050 "Alabama Club"
Which Car Should I Ride? The Museum's open cars as they arrived from Anniston Army Depot in Anniston Alabma. The Museum's open air cars today. 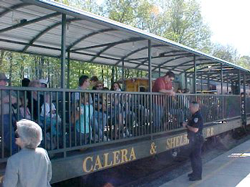 The Heart of Dixie Museum's Open Air Cars began life as flatcars for the U.S. Army. They originally carried the road nos. 35211 and 35300. No. 35211 was built in November of 1940 and No. 35300 was built in 1942. At the Anniston Army Depot, they were outfitted with seating and railings. With seating, Anniston Army Depot was able to provide unique tours of their facility. This also provided better security arrangements since the only way to "get lost" on a tour and cause a potential security breach was to jump off. The Anniston Army Depot later donated the cars to the Heart of Dixie Museum. The museum painted the cars white and renumbered them Calera & Shelby Nos. 301 and 302. Recognizing the need for greater safety, picket fencing was placed on both cars to prevent unintentional falls. The museum eventually rebuilt both cars with improved seating and welded iron railing. They were also outfitted with roofs for the added comfort of our visitors. Finally, they were renumbered 1121 and 1122.